-In another mixed day of QB workouts, NC State’s Ryan Finley showed the best touch and control of the quarterbacks. His feet get a bit inconsistent in team situations, but his timing and mechanics are best among the quarterbacks on the team. -Duke’s Daniel Jones looks the part of an NFL quarterback but is still struggling with the timing of his feet and finishing throws in the pocket. He and Drew Lock continue to show tremendous upside and inconsistency in mechanics and timing as a passer. Michigan's Karan Higdon showed good footwork and hit the hole hard even when hit at the line. He showed natural hands as a receiver, although he did round off his breaks, creating little separation. Notre Dame's Dexter Williams finally flashed some burst through the hole, but still struggled with inconsistency in both the run and pass game. He showed minimal effort on several routes and would look defeated if challenged by a defender. Memphis' Tony Pollard proved he could be an all-around back today as he picked up blitzes cleanly, exploded through the gap, and was able to create separation in the flat. He sunk his hips down when coming out of a break and planted his outside foot hard to create space on an out route that left Coney out of the play. He was one of today's winners and looked more comfortable as the week concluded. -Ohio State WR Terry McLaurin continues to put on a show today. Despite being clocked as the fastest WR in Tuesday’s practice (22.2 mph), McLaurin knows how to choke down his speed and maximize separation in his route running. McLaurin does really well to sink his hips and lower his center of gravity to consolidate his breaks and showed terrific body control adjusting to passes outside of his catch radius. McLaurin destroyed Texas CB Kris Boyd with a double move today and tracked a nicely thrown ball over his shoulder in the end zone. -Georgia State WR Penny Hart has stacked a few good practices together and is using this week to prove he’s a complete receiver and not just a gadget guy. Hart’s twitch and elusiveness is apparent in his route running and he’s shown natural hands with the ability to effortlessly catch balls above his head. -The concern with a few of the small school receivers continued to manifest this week. North Colorado’s Alex Wesley continued to show off his top-end foot speed but isn’t as fluid when it comes to sudden change of direction and had difficulty adjusting to make catches outside his radius. Massachusetts WR Andy Isabella’s bad habit of letting the call get inside his frame and basket catching passes showed up again. Washington's Drew Sample showed good pop off the line when blocking today and kept his feet under him to drive the defenders back. His receiving game was less impressive however as he failed to sell the route and had a hard time shaking free of the linebackers. Boston College's Tommy Sweeny used his big body to position himself well as a receiver and force the linebackers to get their hands on him. He showed good blocking form, but was beat to the edge a couple of times and had difficulty moving his feet to keep up. UCLA's Caleb Wilson showed strong hands and good athleticism in his only day of practice but ultimately failed to stick out. He showed a good release, but quickly surrendered the separation with average breaks. His best play of the day came on a short curl with a defender draped over his back, and he shot his hands out to pluck the ball from the air and holding on to it despite the good swat by the linebacker. -Chuma Edoga of USC is likely the most athletic offensive tackle on the North team. Spending most of his time at left tackle, he has won almost every one-on-one pass-rushing rep this week, significant because it’s built for the defense to win. The long-legged athlete may have done more for himself than any other offensive lineman this week. -To no one’s surprise, Kaleb McGary of Washington had another solid day today. After spending most of his time at right tackle, McGary split time as a left tackle on Thursday. Scouting Report: He was able to get his opponent on the ground on both sides of the line. -A player who bounced back in a big was was Texas A&M’s Erik McCoy, who had the worst day of any offensive lineman on Tuesday. With only two centers on the team, the expectation was to see McCoy beat early and often on Thursday. Instead, he won nearly every one-on-one rep, showing his anchor and mirror ability, even against Arizona State’s Wren, who he struggled with in particular at the start of the week. -Boston College’s Zach Allen has been playing both inside and outside of the tackle this week, but he has yet to really flash a first-round splash play. Often, he is attempting to bend the edge in one-on-ones and offensive tackles simply let him slow churn and run himself out of the play. -In Practice 1, John Cominsky played primarily as an edge defender. In Practice 3, he was mostly used as an interior defender, especially during the stunts period. Unfortunately, Cominsky, who is undersized for an interior lineman, has a tendency of getting washed out of plays and ending up on the ground. -One player who has looked like a quality player in both of his public practices is Byron Cowart, a Maryland end-tackle by way of Auburn. At this point, Cowart’s penetration skills haven’t demanded that he ends up in the first-round conversation, but he has cemented himself as a borderline top-100 type of talent on the field. 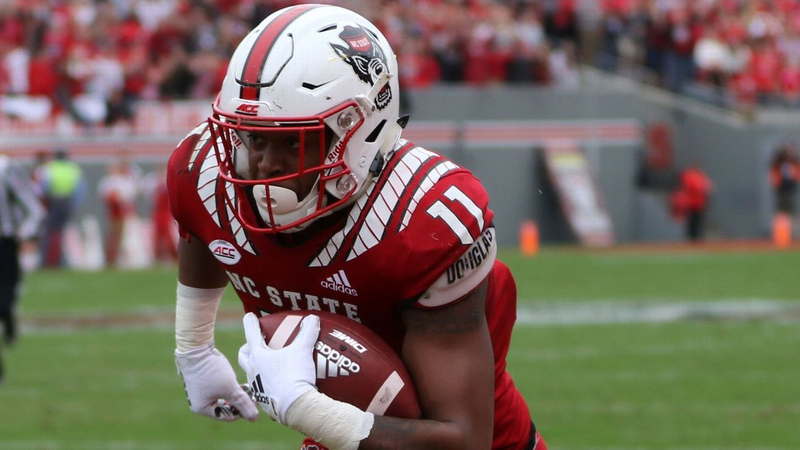 -NC State’s Germain Pratt looks like a middle linebacker but continues to show stiff hips, especially in underneath coverage, that limits his appeal. He showed good burst and filled the gap well today, but looked a step behind in coverage. -Northern Illinois’ Sutton Smith saw nearly all reps at middle linebacker today but was still overmatched. He routinely got swallowed up by lineman that got to the second level and struggled to disengage. He got completely pushed out of a play that resulted in a big gain for Pollard. -Notre Dame’s Drue Tranquill showed good run discipline, fluid hips, and good flat coverage today to emerge as a winner. He looked very comfortable in coverage and showed good transition when pushed to the boundaries. -Boston College safety Will Harris has had a quiet week - in a good way. Harris hasn’t been burned in coverage and has physically held his own against the length of the tight ends in Mobile. Harris got beat on an inside release by Andy Isabella in 1v1s but did well not to panic, turn his head around, and intercept the slant. -Speaking of panicking, the issues that Kris Boyd had at Texas surfaced today. Despite the bite on the McLaurin double move mentioned above, Boyd continued his habit of grabbing players when he loses positioning and can’t mirror breaks. Boyd also refuses to turn his head around and locate the football when he can’t stay in phase on deep routes and opts to play through the man, opening it up to the possibility of interference penalties. -Southern Cal CB Iman Marshall has been solid this week for the most part and registered a nice interception in 1v1s today. Marshall is lengthy, physical corner who doesn’t give up the ground he’s entitled to against possession receivers but his biggest issue will be keeping up with receivers that win with short area quickness, having trouble with Penny Hart in 1v1s.